The Conservation District in cooperation with Harrietta Hills Trout Farm sponsors Fish Day events for the purchase of fish to stock ponds each spring. 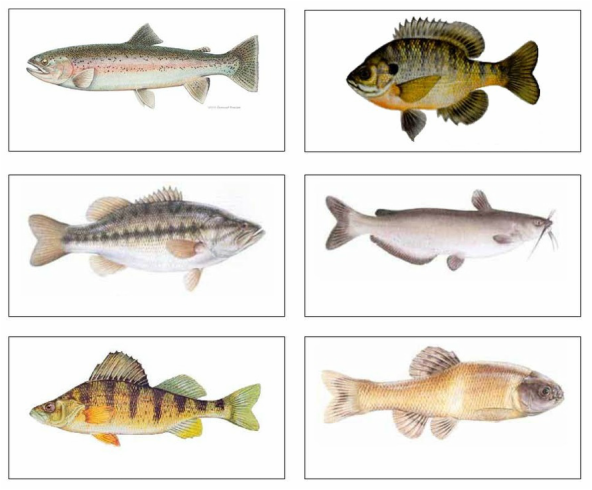 Fish species available can vary, but the species generally offered and information about them are listed below. Phone you order to Harrietta Hills Toll Free 1-877-389-2514 at least 7 days before the Fish Day Event (May 26th). Minimum order: 25 for any species. Meet our truck ON TIME at the Fish Day Event. We provide Oxygen Bags and Oxygen to transport your fish home. It helps if you bring one five-gallon bucket for every 25 fish that you order to set the bags in. Cash or checks only will be accepted for payment of orders at Fish Day. Only the species and sizes listed will be available at the Fish Day Event. Harrietta Hills reserves the right to substitute smaller or larger sizes at an adjusted price, if necessary. Rainbow trout can survive in lakes or ponds as long as there is cool, oxygenated water in the depths. Rainbows prefer water from 55° to 60° F, and will tolerate temperatures up to 75° F. Their diet consists mainly of immature and adult insects, plankton, crustaceans, fish eggs, and small fishes. Stocking rates for trout are a bit tricky, since they are highly dependent upon water quality, but usually no more than 100 per surface acre of water, unless you have a really special trout pond with lots of flowing water, then the numbers can be increased. Hybrid Sunfish, often called Hybrid Bluegill, are a cross between a female Green Sunfish and a male Bluegill. This cross results in a very high percentage of male fish, reducing the reproductive potential of the population. This results in greater growth rates and reduces the opportunity for over-population. These fish are strong feeders, so a robust forage base is necessary. Hybrid Sunfish are generally stocked at a rate of 500 per per surface acre of water. We recommend stocking some Largemouth Bass along with your Hybrid Sunfish to control any future reproduction and avoid over-population and stunting. Largemouth Bass are one of the most sought after game fish. Largemouth are also well suited to most ponds and lakes in the Great Lakes region. Largemouth are tremendous predators and require large amounts of forage to thrive, therefore they are often used to control bluegill populations. A general stocking rate is 100 bass per surface acre in ponds with regular bluegill and 75 per acre in Hybrid Sunfish ponds. Largemouth will reproduce in most ponds but require other predators (like bluegill) to regulate the bass population properly and avoid over-population and stunting. Stocking fathead minnows also provides an excellent forage base for bass. Channel Catfish are omnivores that can add some variety to your pond. Prized as a sport fish and table fare in many areas of the country, the channel cat can be a welcome addition to your pond. Because they tend to stir up the bottom of the pond, we recommend stocking 50-100 per surface acre to maintain water clarity. If your goal is a catfish pond, stock fertile water with up to 200 per surface acre. Please note that channel catfish DO NOT "clean up" pond bottoms. Their feeding habits lead them to stir around in bottom sediments, but they do not clean the bottom. Yellow Perch are a popular choice for lakes and ponds because of their outstanding table performance. Care must be taken when stocking perch as they tend to over-populate and stunt easily. They are best suited to large lakes with predators like walleye or to "perch ponds" that are managed fairly intensively to maintain a healthy population level. Generally stocking 100-200 per surface acre is acceptable. Yellow perch are active predators, so stocking fathead minnows with perch is recommended. Fathead Minnows are an economical forage species to add to almost any pond or lake. These small forage fish spawn prolifically, usually reproducing several times during the summer if conditions are right. Placing any type of woody structure in shallow water will improve their spawning success. Generally stocking 24-40 pounds per surface acre will establish a good population. Stock up to 100 pounds per acre if you have a large number of bass, or other established predator species. Visit the Harrietta Hills web site to view all they have available. They can deliver any of the merchandise found on their website to Fish Day, saving you money on UPS shipping. Just CALL in your order for merchandise and tell them you would like it delivered to the Fish Day. This offer is only available with phone orders, not on-line orders. Even if you don't need fish, the pond management products offered by Harrietta Hills can be delivered for pick-up at Fish Day. Stocking of Michigan public waters will require a permit from the Michigan Department of Natural Resources and is the responsibility of the customer. Some private ponds with a permanent inflow or outflow also require a permit. Determination of the necessity of a permit and obtaining a permit are the responsibility of the customer. Download Permit application from the MDNR.